Ask three people about the origin of pawnshops and you'll get three different answers, each with its own variation of the truth. Most people agree that they don't know for sure where "pawnbroking" started, however the act of lending money can be traced back to ancient China over 3000 years ago. Pawnbroking is also known to have existed in early ancient Roman and Grecian civilizations. Due to years of financial uncertainty and economic depressions, pawnshops became a necessity throughout Europe in the Middle Ages. The pawnshop symbol of the three gold balls is believed to have originated with the Medici Family of the Tuscany area of Italy. The Medici family crest (or coat of arms) was three gold balls. One story of the crest is that one of the Medici's in the employ of Emperor Charles the Great fought a giant and slew him with three sacks of rocks, thus forming three gold balls as part of their family crest. A second theory about the pawn symbol is derived from the pawnbroking Patron Saint, St. Nicholas of Myra. In this story, a poor man had three daughters but could not afford a proper dowry, resulting in their inability to marry and failure to obtain employment. Nicholas decided to help the man, however not to insult him, Nicholas went to his house under the cover of night and threw three purses (one for each daughter) filled with gold coins through a window opening into the man's house. While this is not known to be the true origin of the pawnshop symbol, Nicholas still remains the patron saint of pawnbroking for his help with the poor. The Medici family and the Lombard's in England were the primary money lenders in Europe. 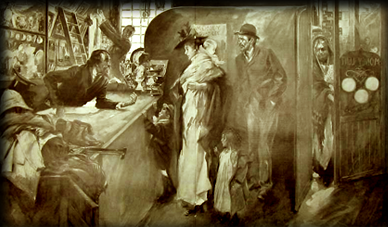 The Lombard's are attributed with operating many pawnshops during this time, as well as being the first registered money lenders in England. Over time many financial lenders came to know of the fame and fortune of the Medici family and adopted their family emblem (the three gold balls) as their own, in hopes of similar success. The three balls became a worldwide symbol of money lenders, now known as "pawnbrokers". Some customers of pawnshops during the Middle Ages included many royal figures. One such example is Queen Isabella of Spain who pawned her crown jewels to finance Columbus' voyage to America. It is possible to imagine that, had a pawnbroker not lent the Queen money, Columbus might never have made the voyage to America, and our history could have been different. While many people believe Pawnshops to be an evil industry funding terrorists and drug users, there are some 50+ million people in this country without bank accounts (for that matter any sort of savings) and credit. Lack of banking relationships make it nearly impossible to obtain any kind of loan from a bank. The pawn industry fills that gap and helps people obtain some quick money when a bank says no. Many modern day customers of pawnshops include politicians, movie stars, sports figures, and business owners. GCPAWN of Lauderderhill gets a new store front sign! Our ENTIRE inventory is now available for purchase through our website! Let us ship it to you. Co-owners Josh and Adam Davis with Shark Tank star Daymond John. Our new brand continues to expand.